Going out is so overrated, amirite? The loud music. The mindless small talk. The constantly being asked to snap a photo for your friend’s dating profile from five different angles. No, the true rite of passage of young adulthood is the realization that you’ll likely have a much better night just staying home, thank you very much. With an on-demand universe of approximately 2,974,348 TV shows and movies at your fingertips and a network of friends just a text away, all that’s standing between you and the perfect night in is the food. 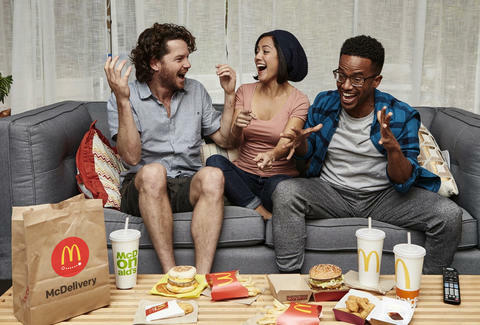 And now, thanks to McDelivery, your house party menu can include McDonald’s. Yes, following years of playing hard-to-get, requiring a drive to a physical location to get your Big Mac on, McDonald’s is now delivering to customers across the US in partnership with UberEATS. After testing the service stateside in three Florida cities last winter, and rolling out to others such as Chicago, New York, Dallas, and Columbus (the perpetual beneficiary of America’s fast food test marketing), you can now get that sweet McFlurry fix from sea to shining sea*. The growing McNuggets-on-demand empire (more than 3,500 locations strong in the past three months) also comes just in time for back-to-school season, so good news, college students: Those scrumptious Nuggets are now a few taps away. No more convincing your roommate's girlfriend's RA to take you on a midnight drive-thru. So fast-food lovers, just download the UberEATS app, select McDonald’s, order your favorite meal, then sit back and congratulate yourself on your #BigNightIn skills. Oh and thank your driver, too, because those people work hard. *At participating McDonald’s. McPick 2 and other offers excluded. Delivery prices may be higher than at restaurants. Booking fee applies.